Chocolate and mint are made for one another in this recipe! There’s nothing better than a slice of Chocolate Mint Amish Friendship Bread after dinner. For a recipe that tastes even more like Andes Mints, increase milk to one cup, add ½ cup cocoa powder and substitute 1 cup chopped Andes candies for chocolate chips. Tonia Edens added these helpful hints: I added 1 cup coconut flakes to batter and drizzled the bread with a cream cheese glaze with coconut flakes for a final touch! Chocolate and mint are made for one another in this recipe! There's nothing better than a slice of Chocolate Mint Amish Friendship Bread after dinner. Pour the batter evenly into loaf or cake pans. I made these using the modifications in the ‘Kitchen Notes’ and they turned out delicious! The Andes pieces do not maintain their shape or color but you can tell they are in there. Very yummy! I made the Chocolate Mint Amish Friendship Bread this evening. I added 1 cup coconut flakes to the batter. 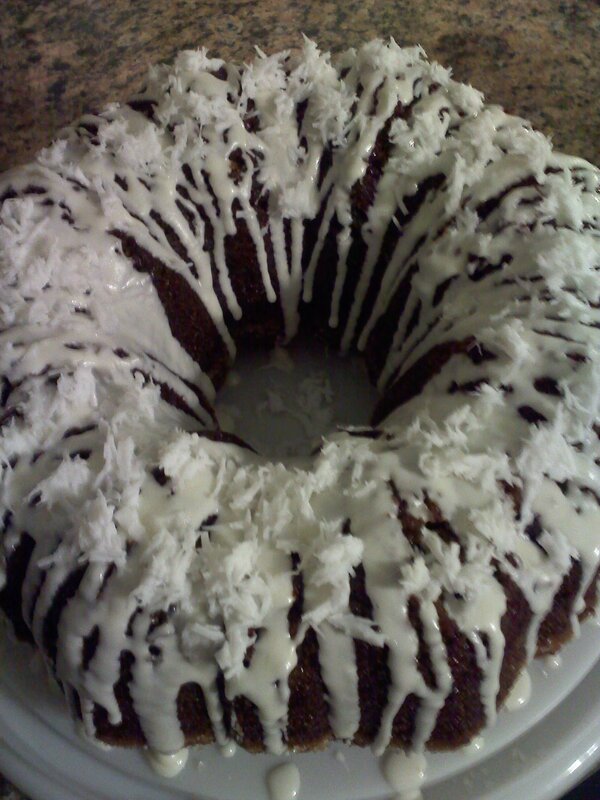 Cream cheese icing was drizzled over the top then sprinkled coconut flakes on top of the cream cheese. Delightful with a nice cup of coffee! Just got the photo and will be adding it soon! Sent you an email as well about the cream cheese glaze — was it the frosting version from the Recipe Box or one of your own? Seemed more of a drizzle and would love to include it, too! Yum! I made this bread with a box of devils’ food chocolate pudding and it came out great! I was completely freaked out when I sliced the bread for my co-workers and saw that it was green on the bottom half! I didn’t use any food coloring, but the mint extract must have had some color in it?! I just went to take a picture and there’s only half a slice left surrounded in crumbs…I guess it went over well! This sounds like a delicious recipe for Christmas. Oh.my.gosh.! This looks and sounds absolutely delicious! 2 of my favorite flavors in one. Thanks and God Bless!